A number of Turks and Caicos Villa Rentals including some on famous Grace Bay Beach have “EARLY BIRD SPECIALS!” For reservations made before 31 December 2013 for stays between 1 May 2014 and 31 October 2014 you immediately SAVE 10%! SAVE 10%! ONLY $1,035 per night! Villa Del Sol is a 3 bed, 3 bath luxury beachfront home that showcases the sun, sand and ocean with walls of windows and direct walkout onto those white sands. A private swimming pool and outdoor living spaces of undeniable character and comfort will enhance your experience. The villa is fully equipped with luxurious furnishings and linens, as well as high end appliances. A true beachfront vacation rental right on famed Grace Bay Beach. Find out more about Villa Del Sol, Grace Bay Beach, Providenciales (Provo), Turks and Caicos Islands. SAVE 10%! ONLY $1,125 per night! Welcome to a tropical slice of heaven at the Windrose Estate, comprised of two separate buildings; the first, known as the ‘Beach House’, is a large, spacious villa right on Grace Bay Beach with 3 beds 2.5 baths and outdoor jacuzzi. The breath-taking ocean views and the sugar-fine beach will never be forgotten. The second building is a spacious 3 story duplex, which sits at the end of a private winding pathway behind the Beach House. The duplex is composed of two villa rentals known as the Cottage - a 1 bedroom bath ensuite apartment - and the Guest House - a 2 bedroom and loft apartment with baths ensuite. If you're looking for the perfect extended family beach rental with beach and ocean as far as the eye can see, Windrose Estate is for you. 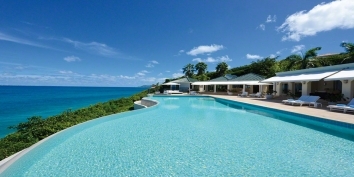 Find out more about Windrose Estate, Grace Bay Beach, Providenciales (Provo), Turks and Caicos Islands. SAVE 10%! ONLY $878 per night! This luxury 4 bedroom, 4.5 bath contemporary villa has a large private pool with swim up wet bar, along with a BBQ, ice machine, fridge and stereo system under a Tiki gazebo. From the alfresco living room and upstairs bedrooms of this upscale, gated, beautifully appointed two-story home, you will enjoy birds-eye views of our renowned shimmering turquoise-blue waters and white sands. Your beach, the most private stretch of world-famous 12 mile stretch of Grace Bay beach, is but a 2 minute walk from your garden gate. Pelican Vista is the perfect location to create memories to last a lifetime! Find out more about Pelican Vista, Grace Bay, Providenciales (Provo), Turks and Caicos Islands. SAVE 10%! ONLY $360 per night! Allegria is a 2400 sq ft family-friendly, beautifully furnished and spacious 2 bedroom, 2 bath beach front villa with terraces and beautiful views right on Channel Beach, around the corner from the 12 mile stretch of famed Grace Bay. You will enjoy hours of happiness and privacy at this exclusive address. Find out more about Allegria, Channel Beach, Leeward, Providenciales (Provo), Turks and Caicos Islands. SAVE 10%! ONLY $1,169 per night! Point of View Estate has 6 bedrooms, 7 baths, a large terraced pool with comfy loungers,alfresco dining and multiple terraces with views that will take your breath away! And Babalua beach, one of the most private beaches in Grace Bay, is but a 3-4 minute walk away. Available fully staffed for additional cost. Find out more about Point of View Estate, Grace Bay, Providenciales (Provo), Turks and Caicos Islands. SAVE 10%! ONLY $788 per night! 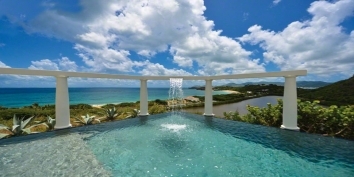 South Seas Villa is a gated, private 5 bedroom, 5.5 bath estate that sits on 4.5 acres in Silly Creek Estate in Chalk Sound, Providenciales (Provo), Turks and Caicos Islands. 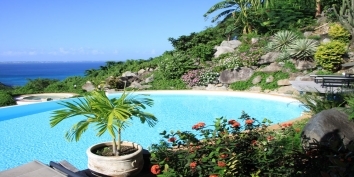 Find out more about South Seas Villa, Silly Creek / Chalk Sound, Providenciales (Provo), Turks and Caicos Islands.